Sue finds it amusing that travelling in the TARDIS is a traumatic experience for everyone concerned, and when the crew are thrown violently to the floor, she doesn’t see it as a portent of doom, she regards it as business as usual. She’s wrong, of course. Sue: What the hell is going on? This is a bit mental. Her bewilderment lasts for several minutes. In fact, the last time she looked like this, I was explaining the plot of A Serbian Film to her. She is, of course, referring to Hartnell’s bandage (“He looks even more ridiculous than usual”), but she’s even more flummoxed by this episode’s infamous running-with-scissors scene. Sue: That’s bang out-of-order. I wouldn’t let my children watch that. That was borderline irresponsible. There’s also this weird insinuation that Susan is self-harming. What time did this go out again? As the bickering and paranoia reaches its peak, Sue convinces herself that Ian and Susan have been possessed by an evil alien intelligence and it’ll be up to the other two to sort it out. Sue: What are they flapping on about now? I can’t tell what I’m supposed to be reacting to. Have I missed something important? Me: It’s a melting clock. Don’t worry about it – it would have been difficult to work out what it was supposed to be on a tiny television set in 1964. Sue: I can’t work it out on a 50-inch plasma! When the Doctor drugs his companions, Sue doesn’t bat an eyelid. Sue: The Doctor is the only person who’s acting in character. He’s always unpleasant. As the episode draws to a close, Sue suggests we save the next one for tomorrow. And she’s usually so eager to press on. In a desperate attempt to inject this instalment with some much-needed urgency, I inform Sue that elements introduced in this story will be referenced later in the series. There’s the Heart of the TARDIS from Boom Town, for example, and the incessant neck-rubbing will be referenced throughout Jon Pertwee’s tenure. She promises to make notes for future reference. Sue: The Doctor is definitely possessed by something – he can’t get his words out. He’s made a right mess of the title of this episode for a start. As the story hurtles towards its rather baffling conclusion, Sue begins to flounder. Sue: I’m completely lost. What the hell are they going on about now? Me: Try to think of it as an edition of the 1980s quiz show 3-2-1, with the TARDIS in the Ted Rogers role and the Big Bang as Dusty Bin. 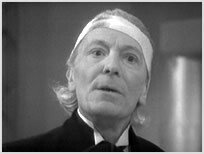 William Hartnell is almost certainly Norman Collier. Sue: So this has been a series of cryptic clues about a faulty switch? Why didn’t the TARDIS just put the words, ‘There’s a problem with my switch’ on its monitor? 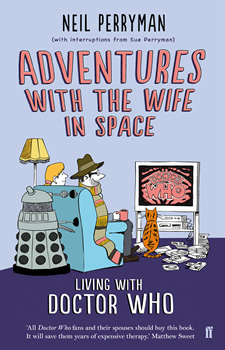 I’d hate to ring a support line if I had a problem with a TARDIS – it would be murder! And what were the scissors supposed to represent? A holiday for two in Corfu? Remind me never to take Sue to Corfu. Incredibly, she doesn’t react to the hand-written note scrawled above the fast return switch, and when I eventually point it out to her she assumes the Doctor must have put it there because he’s suffering from Alzheimer’s. However, when Hartnell leans back on the TARDIS console to deliver a soliloquy about the birth of a sun, my wife is spellbound. Sue: I loved that. What a great speech. That’s the first time he’s acted like the Doctor. I especially like the way they framed and lit that shot. It was very dramatic. The Doctor apologises for his actions. 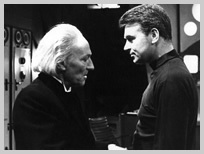 Me: I knew you’d like Hartnell eventually. Sue: Well, that was crap. Sue: Really? Do the fans like this one? Sue: Most of it was dire, but I really liked the last five minutes. I break out into a cold sweat. If my wife gives this story a higher score than 100,000 BC the universe might implode. And then she told me she would have scored The Edge of Destruction a big fat zero if it hadn’t been for its denouement. Me: That’s a very good question. Sue’s reaction to the news that over 100 episodes of Doctor Who are currently missing from the archives was unique to say the least. Sue: What a blessed relief. When I explain to her that a man named John Cura and a small army of fans armed with reel-to-reel tape recorders have made it possible for us to experience these stories after all, she gives me a withering look. Sue: **** off. I’ve read some of the comments on the blog. These are the recons that everyone keeps going on about, aren’t they? Rob Shearman says I shouldn’t watch them. Me: Stop pretending you know who Rob Shearman is. This is a make-or-break moment. If I pull out the recon to ‘The Roof of the World’ and she can’t handle it, the experiment could be over. I don’t even know if I can sit through it. Luckily for us, there’s a condensed version of Marco Polo on The Edge of Destruction DVD, which means we can experience all seven episodes in less than 30 minutes. What do you mean, that’s cheating?